The Baltic Sea is located in northern Europe and borders Sweden, Finland, Russia, Estonia, Latvia, Lithuania, Poland, Germany and Denmark. It drains into the Kattegat by way of the Öresund, the Great Belt and the Little Belt. The shallow sills are obstacles to the flow of heavy salt water from the Kattegat and the Baltic Sea is therefore one of the largest brackish inland seas by area. It occupies a basin formed by glacial erosion during the last few ice ages. The origin of the name is speculative, and the first to name it `Mare Balticum` was the eleventh-century German chronicler Adam of Bremen. 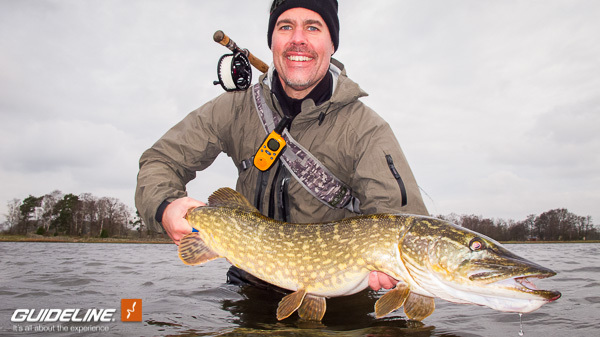 But above all – there is pike! 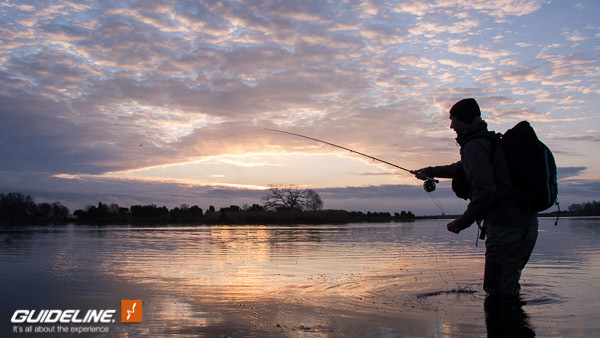 As a fly angler with a heavy craving for big fish in shallow water I just love the southeast coastline of Sweden, facing the Baltic with it´s many bays, coves and shallow grassy areas. I have many great memories from this piece of coastline, and in late fall we make an annual trip down here. We rent a cabin, get a good doze of food and beer and then fish from sunrise to sunset trying to catch one meter pikes in knee-deep water. This year we faced some really challenging conditions. Due to the warm autumn in Sweden water temp hit near 10C degrees in many places, and as a side effect much of the shallow water grass and vegetation were still intact and rooted to the bottom. Top this with northerly winds, clear sunny skies and extreme low water, and you get the picture… Ideal conditions are the opposite; chilly water little on the high side, south- or westerly winds and a cloudy, grey sky. So the firs two days we really struggled. We caught some smaller fish near the drop-offs to deeper water, and spooked better fish in the shallows. Spooked as in walked into them… We could fish a shallow area very throughly with delicate casts and discrete flies with zero interest from the pikes. When we waded over the same area minutes later the fish took of and fled with big waves in the glassy flat surface. In the evening of day two we hit the sauna, had some beers and a burgers, some more beers and checked the weather forecast and waterlevels. It looked quite promising for the next day as the wind would turn during the night and we would get a small chunk of water the next morning. As we discussed places back and forth, we decided to head back to the place where we did found better fish but did not get any bites. From earlier trips we knew that a small switch can change the whole game. And lo and behold, this time our plan proved to be a lucky strike! The windshift together with clouds and aprox 12cm/5inch of water hitting the shallow bays gave us a four hour window with pikes hitting our flies. We found fish both on the outer edges on the seaside, but also closer to the shore and near the reeds and the really shallow water. Cant say we scored really good numbers of fish, but the average size were nice with eight fish exceeding 90cm/36in and a top fish of 99cm, near 40 inch. The boys fished some different rods and reels, all 9´ #8. The old trusted LPXe RS again proved to be a solid performer, and most rods were fitted with the Haze V2 68 reel with the Guideline Pike WF8F. I fished two rods from the lower end of the price range; the Epic kit rod and a new 9´ #9 sample in the Exceed range. In all, today you get a lot of bang-for-your-buck from those well priced Guideline ranges. Leaders are simple yet effective; a straight piece of two meters of 0,66 mm PowerStrike+, or the heavy end of a PowerStrike+ Salmon Leader. A miniature Perfection Loop in the lower end makes it easy to add a piece of 40-50 cm knotable 20lbs wire tippet. 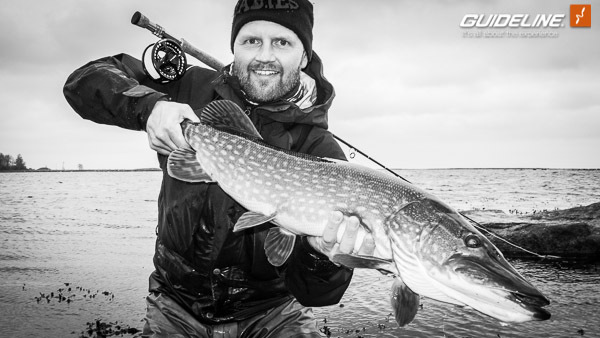 My approach on fly selection is quite simple for the late season Baltic pike; nice weather – black/brown 15 cm flies with a small amount of flash; cloudy weather – green/gold 20 cm flies with more flash and bling. All flies with neutral density as they are fished near the surface all the time. 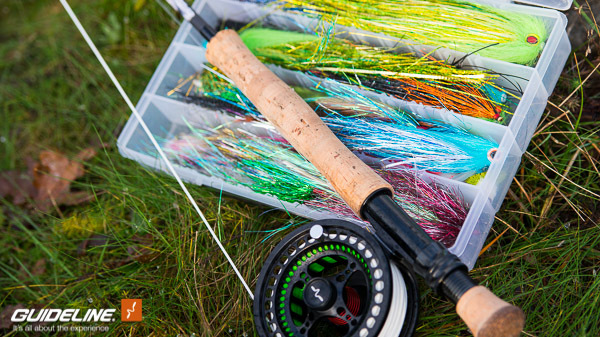 Below are some useful links to fishing camps in the area where you find accommodation, rental boats, fishing kayaks, tackle & gear and of course, guides with the latest tips and insights! All written in pure Swenglish, so please pardon any linguistic prances and errors.